If you can't float on your tummy, try learning on your back. A different view can be all it takes to help pick up a new skill. I have done many jobs in my 43 years, but the one I've held the longest is as a swim instructor. I've taught nearly every age group and ability level. Even with a military spouse, aside from small breaks here and there, wherever we lived, I found a local team or country club willing to employ me. I've kicked, paddled and blown bubbles, all while teaching a lifesaving skill. I love the sport of swimming, and I love teaching it even more. As our family looks toward a two-year assignment in a new town, I have decided to hang up my goggles, at least for the foreseeable future. 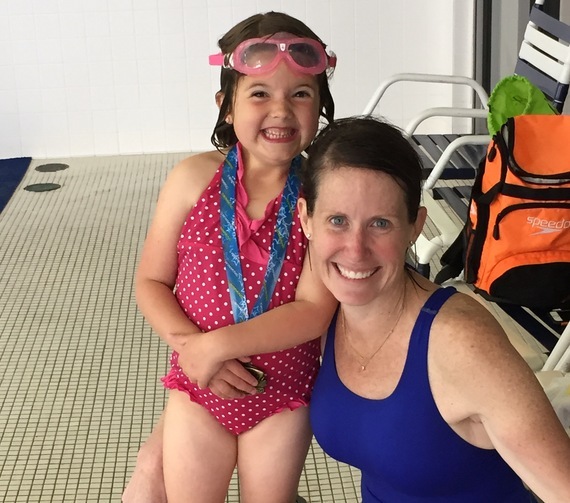 I will miss being in the pool with my little bubble blowers desperately, but as I look back, I can say with full confidence that I gained a great deal of knowledge about life l by teaching the sport I hold so dear. 1. Sometimes, you have to hold your breath, jump in and trust that someone you love will catch you. 2. Eventually, you need to learn to get your head up and take a breath all on your own. 3. When you're tense, you sink; when you're relaxed, you float. 4. Nothing will ever feel quite as exhilarating as the time you let go of a pair of trusted arms and make your first, independent swim. 5. If you can't float on your tummy, try learning on your back. A different view can be all it takes to help pick up a new skill. 6. First accomplishments mean more when your mom and dad are there to see it. 7. It's great to learn new things with your friends, but sometimes, you'll get more done on your own. 8. Good teachers never stop learning from their students. 9. At times your instinct is to push harder, when really you need to push smarter. The more you fight the water, the harder the water fights back. 10. We all touch the bottom sometimes, but we can always push our way back up to the surface. 11. People will be more willing to work for a smile and a lollipop than work to avoid a sharp tongue and a punishment. 13. There will be a time when you feel like you just can't keep going, but don't give up. When your arms get tired and you feel like you can't go one more inch, focus on your kick. 14. One of the most important things you can do in life is exhale. 15. Water always, always makes everything and everyone feel better.